Decide where baby sleeps best. There is no right or wrong place for babies to sleep. Wherever all family members sleep the best is the right arrangement for you and your baby. Some babies sleep best in their own crib in their own room, some sleep better in their own bassinet or crib in the parents’ bedroom, other babies sleep best snuggled right next to mommy in the parents’ bed. Many parents prefer a co-sleeper arrangement. Realistically, most parents use various sleeping arrangements at various stages during the infant’s first two years. Be open to changing styles as baby’s developmental needs and your family situation changes. Sleep is not a state you can force your baby into. Sleep must naturally overtake your baby. Your nighttime parenting role is to set the conditions that make sleep attractive and to present cues that suggest to baby that sleep is expected. Try the following sleep tight tips, which may vary at different stages in your baby’s development. What doesn’t work one week may work the next. Get baby used to a variety of sleep associations.The way an infant goes to sleep at night is the way she expects to go back to sleep when she awakens. So, if your infant is always rocked or nursed to sleep, she will expect to be rocked or nursed back to sleep. Sometimes nurse her off to sleep, sometimes rock her off to sleep, sometimes sing her off to sleep, and sometimes use tape recordings; and switch off with your spouse on putting her to bed. There are two schools of thought on the best way to put babies to sleep: the parent-soothing method and the self-soothing method. Both have advantages and possible disadvantages. Parent-soothing method. When baby is ready to sleep, a parent or other caregiver helps baby make a comfortable transition from being awake to falling asleep, usually by nursing, rocking, singing, or whatever comforting techniques work. So-called “Disadvantages”: Because of the concept of sleep associations, baby learns to rely on an outside prop to get to sleep, so—as the theory goes—when baby awakens he will expect help to get back to sleep. This may exhaust the parents. 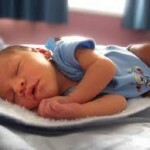 Self-soothing method: Baby is put down awake and goes to sleep by himself. Parents offer intermittent comforting, but are not there when baby drifts off to sleep. So-called “Advantages”: If baby learns to go to sleep by himself, he may be better able to put himself back to sleep without parental help, because he doesn’t associate going to sleep with parents comforting. May be tough on baby, but eventually less exhausting for parents. Remember, in working out your own parenting-to-sleep techniques and rituals, be sensitive to the nighttime needs of your individual baby and remember your ultimate goal: to create a healthy sleep attitude in your baby and to get all family members a restful night’s sleep. Daytime mellowing. A peaceful daytime is likely to lead to a restful night. The more attached you are to your baby during the day and the more baby is held and calmed during the day, the more likely this peacefulness is to carry through into the night. If your baby has a restless night, take inventory of unsettling circumstances that may occur during the day: Are you too busy? Are the daycare and the daycare provider the right match for your baby? Does your baby spend a lot of time being held and in-arms by a nurturant caregiver, or is he more of a “crib baby” during the day? We have noticed babies who are carried in baby slings for several hours a day settle better at night. Babywearing mellows the infant during the day, behavior that carries over into restfulness at night. Set predictable and consistent nap routines. Pick out the times of the day that you are most tired, for example 11:00 a.m. and 4:00 p.m. Lie down with your baby at these times every day for about a week to get your baby used to a daytime nap routine. This also sets you up to get some much-needed daytime rest rather than be tempted to “finally get something done” while baby is napping. Babies who have consistent nap routines during the day are more likely to sleep longer stretches at night. This entry was posted in Baby and tagged baby's development, caregiver, co-sleeper arrangement, crib, fussy baby, infant, nighttime parenting, parent soothing method, parent-infant trust, parents' bed, sleeping arrangements on June 27, 2012 by alwin.